Chronic pain, the kind that lasts for months, is a misery that many of us will likely confront at some time. Whether it has the characteristics of fibromyalgia, back pain or plantar fasciitis, chronic pain can thoroughly disrupt the normal flow of life in ways linked to sleep disorder, depression, chronic fatigue, altered memory and confusion (“fibro fog”). Understanding and mitigating chronic pain receives a great deal of research effort; and pain management is, of course, a favorite of the pharmaceutical industry. A good way into that research, surprisingly, is to first talk about hot chili peppers. Many plants protect themselves from herbivores and infection by producing really noxious chemicals like capsaicin, which makes chili peppers and Tabasco sauce ‘hot’. Another plant invention, the thiosulfinates, makes onion chopping an interesting experience and still others (the isothiocyanates) are produced by the hot wasabi mustard. The plants are protected because their chemical defenses elicit avoidance behaviors and can even cause tissue damage by activating an inflammatory immune response. However, there is very much more to these plant defenses than our gustatory experience. These defensive plant compounds engage pathways in the nervous system that elicit intensely painful sensations. Of course, the function of pain sensation is to warn us to avoid things that can hurt us, but by an interesting twist, the way in which these plant chemicals work also informs strategies for completely eliminating some types of chronic pain, for example the pain of peripheral neuropathy and arthritis. Why is that? Capsaicin is an appropriate model. A subset of sensory neurons that are specialized to send information to the brain about painful events express a receptor protein in the cell membrane that recognizes and binds capsaicin. Many people use topically applied capsaicin creams, containing about 0.1% capsaicin, to lessen the pain of arthritis, a practice that makes the pain neurons temporarily less responsive. This is perfectly safe and effective when the potion is faithfully applied on a daily basis. At a much higher concentration, something very different happens; a single 60-min application of high dose capsaicin in the form of a 8% skin patch produces effective relief for up to 12 weeks in patients with neuropathic pain. Of course, the treatment is excruciating and must be done under anesthesia. Topical capsaicin acts on pain sensory neurons in the skin by a process that some boffins call ‘defunctionalization’; an absurd word that simply means it knocks them out. This is due to several effects that include making neurons unable to transmit messages, blocking the transport of neurotrophic factors so that the neurons eventually die, and causing neuron terminals to shrink away from the site of encounter. Capsaicin kills sensory neurons by binding to and activating a protein in the membrane known as the TRPV1 ion channel. When TRPV1 is activated, calcium ions (Ca2+) flow into the cell and the calcium excess in turn activates destructive enzymes that degrade the cell from the inside. The killing is selective because capsaicin binds specifically to the TRPV1 ion channel which is expressed by only a subset on sensory neurons. Pain sensation disappears because without those neurons, pain information is not conveyed to the brain. Within about sixty days, the population of sensory neurons bearing TRPV1 receptors begins to recover as neuro stem cells proliferate, grow and connect. This is all very elaborate, but I think you see the potential. If the function of TRPV1 channels or the neurogenesis of replacement neurons could be controlled, we would have a new tool for treating chronic pain. TRP channels are found in almost all cells in organisms as diverse as plants, animals and fungi. There are 27 human TRP-channel genes encoding protein channels activated by the binding of a variety of signals from outside and inside cells, or to changes in temperature. Deep investigation of the TRP family is an ongoing effort. Like capsaicin, the active ingredient in wasabi mustard, (わさび（山葵）, binds to and activates a TRP ion channel, this time the TRPA1 channel, also known as the wasabi receptor. The same receptor detects irritants from onion and garlic, as well as volatile environmental toxins and has also been proposed to function as a sensor of noxious heat and cold. TRPA1 is associated with persistent pain, respiratory and chronic itch syndromes and neurogenic inflammation. For more background and discussion see this article by David Clapham. And, for the fun of it, here is a chart about just how hot it can be. 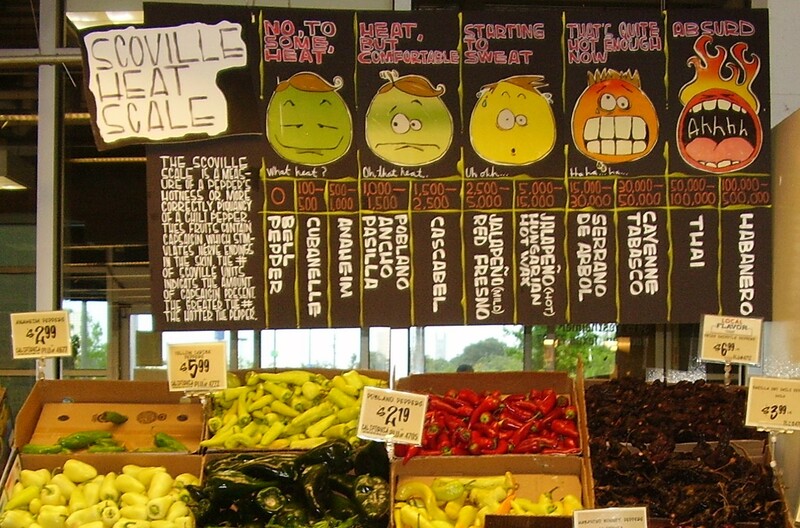 Peppers are ranked along the subjective Scoville scale used by pepperheads. Click the link to see where your tolerance lies. The astonishing thing is that there are peppers, like the Trinidad Scorpion Butch T pepper (score; 855,000) or the Carolina Reaper (2,200,000) that are so far beyond the Jalapeno we are used to (score; 1000). Pure capsaicin comes in at an astonishing 16 million!